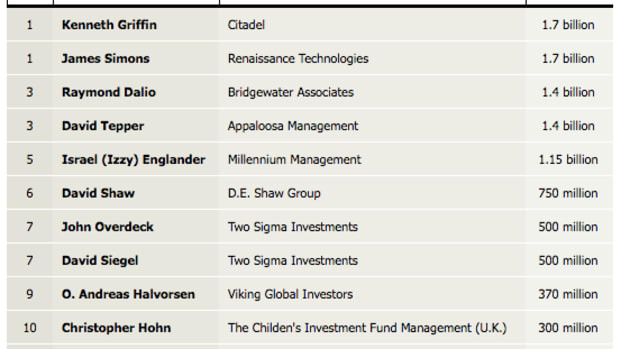 Institutional Investor’s Alpha magazine came out with its annual list of the highest paid hedge fund managers today and if you were hoping the bask in the reflected glow of a staggeringly humongous pile of money, you&apos;ll be sorely disappointed. This year&apos;s haul is more like that pile of lose change you keep on your dresser drawer alongside pocket lint and receipts you&apos;re too lazy to just throw out. How bad was it? The 25 hedge fund managers on our 14th annual Rich List made a paltry $11.62 billion combined, barely half of the $21.15 billion the top 25 gained the previous year and roughly equal to what they book home during nightmarish 2008. The average earnings were just $467 million last year, down from $846 million in 2013, while the median earner made $400 million, down from $465 million the previous year. The one shining spot here is that the second best paid manager, once again, is retired guy Jim Simons.